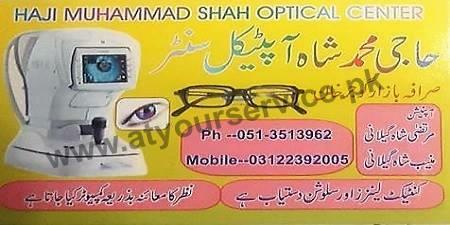 Haji Muhammad Shah Optical Centre sells eye glass, glass frame, contact lens and all eye care accessories are available. Computerized eye sight check up facility is available. Haji Muhammad Shah Optical Centre is located in Sarafa Bazar, Gujar Khan. Eye glass, glass frame, contact lens and all eye care accessories are available. Eye sight check up is done on computer.